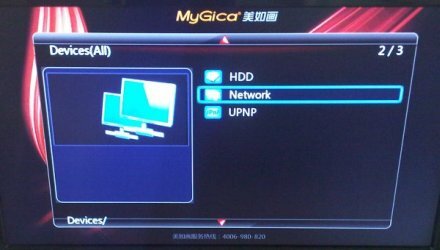 Running HTPC's or media servers in a virtual machine is asking for problems. That's mostly due to lack of video support, or some weird and unpredictable behaviour of some applications. You probably want to skip this section and immediately go for the real thing, that is: get yourself a decent PC and turn it into a dedicated server. Create or clone a new VM. I use at least 256 MB as memory setting for the VM after earlier experiments with XP on low end machines. Enable VirtualBox's 3D capabilities and set the VM's video memory to 32 MB. Clone a VDI and run NewSid, or create a new VDI and install XP. 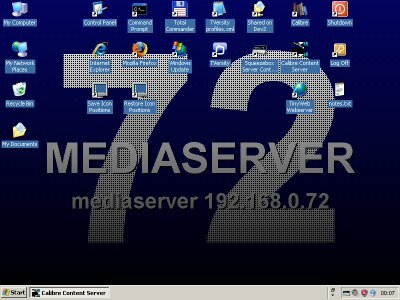 Name this machine MEDIASERVER with a fixed ip address such as example 192.168.0.72. Create a new user in Windows XP called 'Media' password 'media'. Create a few folders, to keep things organized. Make sure the user 'Media' can access these folders. Copy some files to these folders so we have something to test with. After installing and setting up your OS it's time to install all other software... Try and test one application at a time, don't go wild! If (when!) I fall in some specific trap OS related I'll add some notes here. Alas, Windows XP is almost dead (no more patches / updates from April 2014) and you can't buy it anymore, so it's time to look around for something newer. I cannot say anything posoitive about Vista, just skip it. It's like the 32 bits version of Windows ME. You may consider Windows 7 (if you can still obtain a copy) but be aware that you might not be able to run it on onder hardware due to lack of drivers. And updates will stop in January 2020. Then there's the beast called Windows 8. The Metro interface is horrible, and there are some other limitations, but unless you go for Linus it just might be your only chance... I'm going to try to upgrade my home server (currently running XP) to Windows 8, and see how things go from there. 1. Windows 10 by default did not differentiate between active and inactive windows in regards to the tile bar of a window. You migt see a thin line of a different colour surrounding the bar, but that's about it. 2. There are tons of privacy settings to wipe. As they keep moving around check out the Internet where to find them, and what they do. 6. This is also where you find the old time favorites like naming your PC, set visual effects, virtual memory, environment variables and system protection. 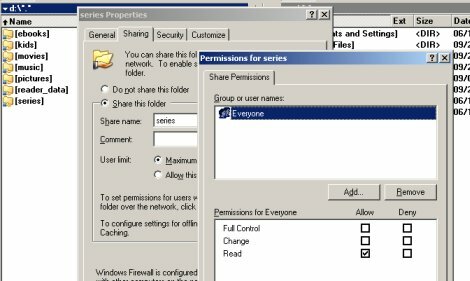 Enable "File and Printer Sharing Echo Request ICMP4 In"
10. 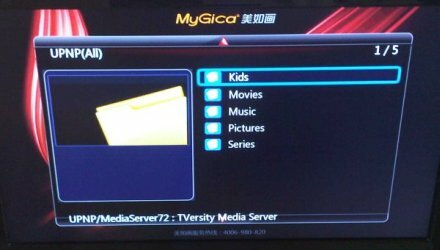 If you are using Kodi on an Android tablet as a client then you may run into timeout errors when trying to connect over SMB. This is due to an non-installed Windows component. Go to Control Panel / Programs and Features / Turn Windows features on or off. In the list enable SMB 1.0/CIFS Server. Note that this is a security risk as the old SMB protocol is no longer safe (but if it matters on a home server is for you to decide). Note: allowing SMB1 will reduce security of your server, as SMB is no longer considered secure! Don't ask. I'm pretty much a Windows guy, but I may be forced to go the Linux way... sigh... Will be continued once I'm either comfortable enough, or can no longer affort Windows. I would have switched to Linux a long time ago, but some of the apps I run simply don't work on Linux, and / or I have not found any alternatives yet. Still, things may improve down the line. Update. I've decided to put some more time in Linux, as I'm fed up with Windows 10's power management. I'll return my homeserver to Windows 7, and replace it and 2019 with Linux. Good riddance, Windows 10. Only install a codec pack if you need one. I've been using the CCCP for a while, the Combined Community Codec Pack. You'll find it here: http://www.cccp-project.net. There are other packs, and the last release of for example TVersity seems to include one itself, though I haven't tried it. Make sure your codec pack works well on your OS and hardware. I'm still using CCCP, even on my 64 bit Windows 7 box, but there are many horror stories around. This may seem to be entirely a matter of taste, but there are some things to consider. Some software may offer document management features, some other software may force you to name and tag each and every file, whilst other software simply uses the folder structure to present all files to the end user. Next when you set up software like TVersity, you can assign specific names / folders / paths / tags / whatever to each folder. And it would be a good idea to keep 'logical' names as close to the real paths, so accessing material through a logical path would be pretty much the same as accessing it through a file share. Note that some software does not support a dedicated temp folder, for example TVersity. If you use an SSD or USB drive as your boot device, it may be smart to install TVersity NOT in its default place (under C:\Program Files) but on another drive (D:\TVersity or something similar). Obviously you may want to consider more than one user, and you may not want your average user to delete or rename your files in which case make sure you give that specific user only Read Only rights. By organizing stuff from the start, you'll have an easier time finding things back, no matter how you access them. 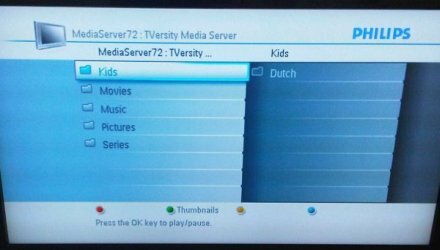 For example, here are some devices browsing my mediaserver, either through TVersity UPNP or Windows shares. MP3's are the prime candidates for such a treatment. If your folder / file structure is consistent, you could use a program such as MP3Tag to replace the existing tags in your MP3 files. Some AVI and MKV files seem to support their own flavour of tags, sometimes accessible through file properties, but if not I have no idea how to manipulate them. Many applications won't run as a 'service'. Blame it on Windows, or blame it on the programmer, but fact is a fact. If you want to run some programs, you have to be logged in as administrator. This obviously is a bit of a security risk, especially if you use your server for other purposes as well. Unfortunately, there's no real and 'proper' solution. 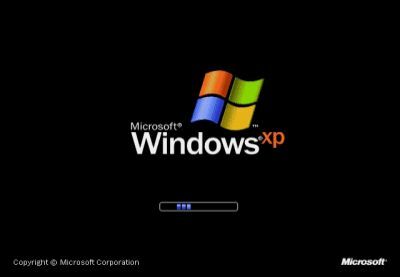 All you can do on Windows XP is allow fast user switching, then, on startup, automatically login as a specific user, execute what you need, then return to the login-screen, whilst everything you started keeps running in the background. Who said this was a perfect world? Anything that would run as a service (and would make sense to run as a service) I set up that way. Everything else I start using a batch file. rem start "AsrXTY" /B "C:\Program Files\ASRock Utility\AXTU\Bin\AsrXTU.exe"
start "ImageBank" /B /D"C:\Program Files\ImageBank Server" "C:\Program Files\ImageBank Server\ImageBank Server.exe"
start "ServeToMe" /B /D"C:\Program Files\ProjectsWithLove\ServeToMe\" "C:\Program Files\ProjectsWithLove\ServeToMe\servetome.exe"
start "Serviio" /B /D"C:\Program Files\Serviio\bin\" "C:\Program Files\Serviio\bin\ServiioConsole.exe"
It's possible to fancy up things. By inserting some delays the actual boot time decreases (ie. launching programs do not compete for resources). I also rearranged all windows to have a better quick overview of what's running and what not. And sometimes 'start' works fine, but not always and then I have to fall back on psexec. The two interesting programs here are mircmd and cmdow. Nircmd is a kind of all-in-one toolbox, which was many different functions. Including a very simple 'delay' function (which doesn't eat up timeslices). Cmdow is often blacklisted as a 'hacker tool', just like netcat. Cmdow in itself is simply a little command line tool that allows you to do all sorts of things to Windows. Including moving or hiding them. It has been abused by malware programmers to hide windows from the user, hence the blacklisting. rem start "ImageBank" /B "C:\Program Files\PhotoStreamr Home\PhotoStreamr Home.exe"
rem nircmd win min stitle "photost"
rem nircmd win min stitle "servetome"
rem nircmd win min stitle "windows task"
rem nircmd win min stitle "calibre"
rem nircmd win max stitle "hardware"
Keep in mind that I log in to Windows because some programs would not run as services. If you do not have that problem, then it's better NOT to auto-login. However, this machine is 'in the closet', there's no physical access, and nothing on it is of sensitive nature, so even if someone would get access to it I wouldn't be worried. You basically want to start the server only when it needs to process or deliver data, otherwise it should be sleeping as much as possible to save energy. Turns out that this isn't always easy... Powermanagement often simply doesn't work, isn't compatible with all hardware, or does other funny things. There's no clear rule, so you're pretty much on your own. All I can do is talk about some of my experiences, and perhaps they may help you find a solution. This is using regular drives. I should try again using an SSD and a better quality power supply. Here's the choice: either implement WOL with magic packets, and accept thatyou may have to 'wake up' your server (though it may wake up accidentally), or leave your server up and running all the time. I've calculated my own usage, and I would save 50 euro per year in energy costs by using WOL. Thus, WOL it is. Update. Hibernate and standby power consumption was primarily caused by an (inefficient) power supply. Remember, once you go into sleep or standby, all your hardware except network card and memory is off. Or is supposed to be off. I've seen a few machines that kept their fans spinning. Sometimes USB ports are powered, sometimes not. Sometimes on-board network cards work, but a PCI or PCIe network card may not recognize a WOL. In hibernation your machine saves all memory to the harddisk, then shuts down. Older machines could still allow a WOL to wake up as they might keep their network cards / chips under power, but newer machines often DO NOT support WOL in combination with hibernation as they shut down all the hardware. Not all machines like or recover well from hibernation, you have to test this for yourself. Advantage: power outages will not bother your PC (it's off anyway) and power consumption will be the lowest. Disadvantage: slow restart, more wear and tear on your harddrives (well, marginally). Return from hibernation will spin up all your drives, even when not necessary. Hibernation is considered a warm boot, as the OS does not reload but tries to restore the system. There's some confusion about deep sleep and standby, as different manufacturers may use different terms. AFAIK: standby shuts down many parts, and deep sleep shuts down even more parts. Some machines may only support one or the other, some support both. If you can use both, you may have to resort to a kill-a-wat power meter to deduce which mode saves you more power. In standby / sleep mode, your machine doesn't save all memory to harddisk, but instead keeps memory alive and under power, yet shuts down pretty much everything else (except for WOL related stuff, obviously). How well a machine handles a warm boot (from standby / sleep) varies. Some machines may not re-enable their PCI(e) cards, some drivers may simply fail after a warm boot, or applications might crash. You may lose drives when using PCE(e) SATA or RAID controllers, and you may lose network cards on older OS'es on a warm boot. To quickly test your setup, you may consider changing the workings of your power button and have the server go into standby / sleep whenever you press it. On most machines the power led will then start blinking to indicate standby mode. Most network cards offer two options for wake up: wake up on either a 'magic packet', or wake up on any traffic. By sending a special message to your server you can switch it on. This message is a so called 'magic packet'. If your server supports 'power saving' modes (stuff called S3, S4 etcetera) and your network card supports WOL you can wakeup your server whenever it's needed. You could opt for waking up the server on any traffic, but for all practical purposes that means your server keeps waking up all the time. Thus never goes to sleep. If you have a configurable router (instead of the typical dumb switch) you might try that approach. For most people though it is not an option, because other systems in the network keep pestering your server with requests, thus waking it up all the time, even if those other systems don't need any actual data. When you are trying to wake up a server, you need the MAC address of the network card. You can't use the IP address, because to use the IP address the machine needs to be already running. Some network cards do not show the 'Power Managment' tab. In those cases you have to fiddle around with the settings under the 'Advanced' tab, perhaps in combination with your BIOS settings. The MAC address of your network card is listed behind 'Physical Address'. On an iPad, install mWOL by Mocha, and enter the IP address and MAC address you've found. Hit the 'Wake up' button to wake up your machine. On Android, install WOL by Ben Finnigan, enter the IP address and MAC address, etcetera. On a PC I use my own tool Wakiewakie but you can do it the hard way using mcwol or something similar. With MCWOL you cannot specify a specific port, you can when using wolcmd. The result of the second ping statement is used as a loop condition. The first ping statement is just there to create a delay. Long timeouts may result in an unrecognised errorlevel. Note: not all routers allow forwarding to a broadcast address. If you have the FritzBox set up to wake up your server and you have Torrent ports forwarded to your server, then your machine will probably never switch off as there's always some other uTorrent client sending you a message to see if you're still alive, which in turn triggers the FritzBox to send that WOL magic packet to your server. Solution: disable or manually switch on / off (the rules for) those forwarded ports. You may have to manually enable / disable those rules, enable uPNP, or accept slightly slower speeds and less sources without those ports forwarded, however in most cases you won't have to do a thing, the NAT protocol in the router will take care of it. What if it all doesn't work? Google for solutions, you may have to resort to registry edits. Again, head to Google. Windows 8 and 10 have Micky Mouse features to avoid inadvertent wakeups... so they shut down the machine if there's no user. Makes sense on a laptop, doesn't make much sense on a home server. You probably have to resort to registry edits, yet again. Server shuts down, even when busy. The catch is often it isn't busy enough. Especially Windows XP suffered from this problem. I never found a solution..
Server doesn't go back to sleep... ever! Note: with hibernation enabled the machine will go into hibernation, not into standby. With standby enabled and hibernation disabled it will go into standby. Either ServeToMe or ImageBank needed killing the Java engine (I forgot which one :-)) and the Serviio lines are no longer required since I uninstalled Serviio. If power management standby after 120 minutes works properly, the computer will go into standby, and nothing else happens. All is fine. If the computer is still on at 00:00 Adobe Flash will look for an update. If someone left SqueezeSlave playing, it will be halted at 00:55. If the computer is still on at 01:00 it will run a Windows Update. If the computer is still on at 02:00 a previous standby attempt didn't work. If it has been idling for 30 minutes it will try again, except on Sunday. If the computer is still on at 03:00 it will try a full shutdown. I set the sleep delay time (Put the computer to sleep) to a long period, ie. 5 hours. Typically 90% of the time something happens during those 5 hours, so effectively the computer never goes to sleep. It sometimes does, but rarely. Most days, my server is triggered by someone starting up a SqueezeBox player, and it automatically shuts down at 01:00 every night.Sometimes an update might keep it awake, but it is rare. If your server is somewhere where you do not have immediate and convenient access to it (attick, garage, broom closet etc.) then install a remote management tool like VNC. 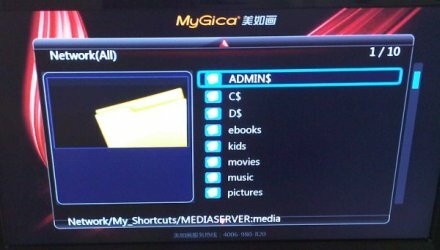 It allows you to remote control your server, and you definitely want that! There are many flavours of VNC. TightVNC seems to work well for many people. 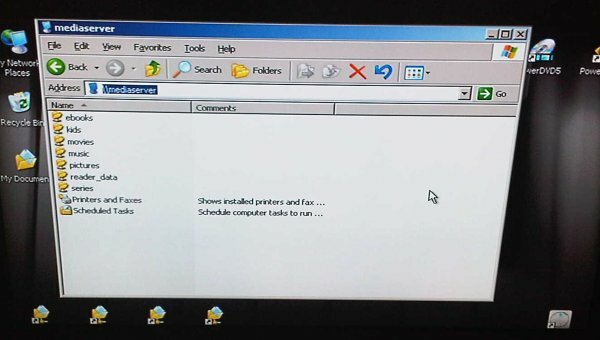 When installing VNC on the server, install it as a 'service' to keep it running, no matter if you're logged in or not.